*I am an affiliate partner of Goldstar because I’m a fan of their free tickets and have had positive experiences with Goldstar. Please see my disclosure policy if you have any questions. 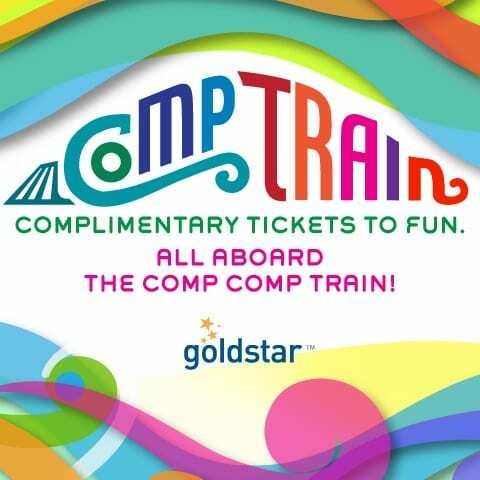 Goldstar Boston will occasionally load up their Comp Train with thousands of FREE tickets to live theater, concerts, dance, comedy and more! Starting today to August 25, 2017, The Goldstar Comp Train is back with thousands of complimentary tickets to great events and more in Boston! Keep in mind that free tickets can go fast, especially for popular event tickets. You do need to pay a small ticket fee per ticket, but you can find some great deals, especially when you receive complimentary tickets! You may also want to download the Goldstar App available on iTunes or Google Play for free because sometimes their will be exclusive app only offers for free tickets and more. For more information or to view free tickets aboard the Comp Train, please head here.